The wireless headphones market is getting pretty crowded these days. Ever since Apple dropped the stink bomb about removing the headphone jack from the new iPhone models, manufacturers have been falling over themselves to issue Bluetooth headsets. One company that was way ahead of the game was Bowers & Wilkins. They’ve been making sleek Bluetooth cans for years, with their P5 Wireless model being among the standard bearers. And now, they’ve come out with two new models: the wireless P7, and the ultra-luxurious wired P9 cans. It’s the former we have on the block today, and after a month rocking them, we can say this: they are bloody marvellous. Labelling a pair of headphones as the most gorgeous around is, obviously, a subjective judgement. To which we say: if you can look at the B&W P7s, and you aren’t immediately awed by how pretty they are, there’s something wrong with you. Other high-end models may sound better. There may be headphones that get more rich detail, a wider soundstage, finer articulation. But none of them are as gorgeous as these. The cups themselves are soft rectangles of sheep’s leather, built just wide enough to encase the ear without pinching. The leather feels like something you’d find in a luxury car or on a really capacious armchair, and even running your hands over it is an absolute pleasure. And where most models would include plastic, the outer cups are sheathed in identical leather, albeit on a more rigid structure. 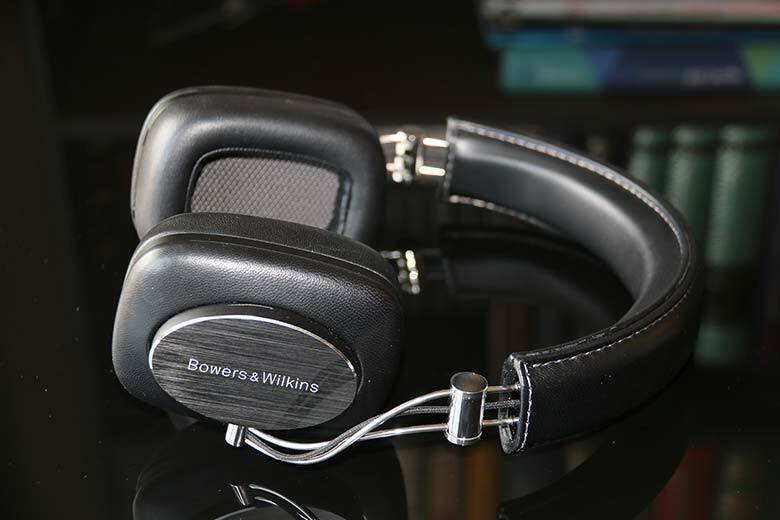 The drivers have an outer casing of brushed metal rising from the housing, each with the Bowers & Wilkins logo on the side. This is probably the only fault that we could find with the design, in that we wish the logo was a little bit more discreet. On the other hand, there’s no denying that it looks and feels great: it’s made of embossed metal, raised up slightly from the surface. The right cup has a series of control buttons, as well as a power/Bluetooth switch on the bottom. The cups contain an incredibly clever feature. Most wireless headphones have a tiny port embedded for a separate wired jack, for when you want to save battery. The P7s have one, too – but it’s hidden away behind the magnetised inner cups. Both of them can be pulled away, and on the left-hand side, you’ll find a discreet 3.5mm headphone jack. We not entirely sure why you need to pull the right hand cup away, since there’s nothing behind it, but all the same, it’s hard not to marvel at the clarity of thought that went into these. They’re magnificent. The most eye-catching thing about these headphones is a design feature that is common to most of B&W’s cans: the swooping metal accents rising up from the cups to the headband, linking the two together. They look flimsy: like you could snap them with a sharp look. But it would take some real work to damage them. Despite their thin appearance, they are hugely strong. An almost invisible, black-fabric-covered speaker wire runs up between the accents, terminating at the hinges, which have clear left and right indicators. The accents actually remind us of the Parrot Zik 3 (full review here). Those come from the same school of design, and offer far more functionality than the P7s, but the latter has them beaten for sheer design class. The only thing on the headphones that isn’t metal or leather is a thin band running around each cup, which, on the right-hand side, contains the controls. These seem cheap at first glance, but are incredibly well-designed. A raised center button is your central function key, allowing you to play, pause, fast forward, rewind, or take calls, and flat buttons above and below it function as volume controls. These all work incredibly well, and height differences allow you to find them without looking. Folding the headphones up is easy too, as they swing up with the slightest pressure. The headband itself is made of identical leather to the cups, wrapped around a metal core. It’s not super flexible, but these are hardly the sort of headphones that you’d toss into a gym bag. It’s going to sound like we’re shilling for B&W. We swear that’s not the case. These are quite simply one of the best-designed pairs of headphones available right now, and one of the most beautiful. Absolutely stunning. What wasn’t immediately stunning was the fit, which had us worried a little. The first impression was that of tightness. The headphones exert a reasonable clamping pressure across the ears and skull, and although the soft leather cups weren’t pinching our ears, they were still very much present. In our experience, this can be a bit of a warning flag for comfort over long periods, and so we’ll admit, we were concerned. Surely B&W hadn’t nailed the design and then completely fluffed the basics? We needn’t have worried. They may have been slightly tight, and we may have always been aware that we were wearing a pair of headphones, but comfort was never an issue. Even over long periods, we never had a problem – there was no ear ache or pinched cartilage that is often the hallmark of lesser models. The P7s sat comfortably, and the fatigue we were expecting never materialised. It’s actually quite a remarkable achievement. They might use acres of metal, but they never felt heavy – despite being slightly weightier than many of their competitors, like the Sennheiser Momentum Wireless (full review here). Those clock in at 9.5oz, while the P7s have a bit more bulk, at 10.2oz. Admittedly, neither of those are particularly heavy, but it’s still good to see that the design finesse extends to the comfort and fit. Those who aren’t into over-ear headphones may not enjoy these, but if you want your ears being by supple sheep leather (and who among us doesn’t?) Then you’re in for an experience. So far, these cans haven’t put a foot wrong. Perhaps it’s the audio quality that will trip them up. After all, these are Bluetooth headphones, and as anybody who hangs around us for long enough will confirm, we don’t put much stock in Bluetooth being able to send high quality audio data, even with newer codecs. Well, you can file that one under Things The Master Switch Staff Need To Re-Evaluate, Volume Fifty-Seven, because the Bluetooth driven audio quality of these headphones is absolutely magnificent. A lot of Bluetooth audio tends to be stripped of its finer nuances, but that simply wasn’t the case here. B&W have remained pretty tightlipped about the technology inside these, beyond saying they have standard 40mm dynamic drivers with nylon-damped diaphragms, but frankly, we would only be mildly surprised if they told us they’d brought back audio technology from another dimension, and installed it in each earcup. Again, it’s hard to talk about these headphones without sounding like an advertorial for B&W, but we couldn’t get over just how good it was, especially for this price range. What immediately struck us was how much character the sound had. Bass was robust without being overpowering, and had plenty of character and warmth. It didn’t feel like it came at the expense of the other frequencies, either. While we did pick up a tiny bit of fragility in the highs, it was only very fleeting, and the overall audio picture was one of rich warmth. It wasn’t quite as good as having an amp-driven pair of open backs strapped to our noggin, but it was wildly better than any pair of Bluetooth headphones has any right to be. There was real depth to the soundstage, too, and the level of detail we picked up was absolutely extraordinary. Although these aren’t designed to be used with an external amp/DAC, they work perfectly well with one, and if you use one you like, they’ll absolutely roar with pleasure. We tried ours on a Hafler HA75 (review coming soon) and it was glorious. We spent quite a while trying to find more cracks in the sound – trying out different genres, in the hopes that we’d uncover a weakness. There simply aren’t any, even for tougher genres like heavy metal, which can suffer from muddiness. While, again, these aren’t going to compete with the depth and nuance of ultra high-end cans, the sound quality they offer is the audio equivalent of their design: rich, luxurious, almost flawless. More importantly, they are fun. They don’t pretend to deliver reference-quality sound, focusing instead on audio which has character and warmth. Call quality, which we tested on multiple occasions with multiple handsets, was just fine. Pairing the headphones with Bluetooth was straightforward, too, and as long as our phone had it turned on, the cans never failed to recognise it, with the triumphant little jingle in our ears when they connected. Battery life was excellent: we got approximately fifteen hours out of these at around 65% volume before they required a recharge, which is very good indeed. The accessories for these cans are fairly standard. They aren’t quite as exciting as the headphones themselves, but they get the job done without too much fuss. Chief among these is a soft leather carrying case with a magnetic snap clasp. It’s hemispherical, and has just enough room to take the headphones. If there’s one criticism of the package, we’d say it’s this: you definitely aren’t going to have much room for the cables in the case, once the headphones have been crammed in. Still, it’s nicely designed, and feels appropriately luxurious. The box that the P7s come in does that annoying thing whereby it has a single access point at the bottom, sliding out extremely slowly - you have to give it very gentle shake to urge it along. Once you actually got the damn thing loose, you’ll find the folder that headphones positioned in a slick moulded insert, positioned at a slight diagonal. Underneath it, you’ll find the case, containing the cables, as well as assorted safety instructions and a very clear QuickStart guide that we found no problem to use. If anything, this is where we’d like to have seen a little bit more design thought. The packaging works just fine, but it doesn’t make the initial impressions of the headphones feel particularly special. We don’t put a lot of stock in packaging, so this is nothing but a minor blemish on an otherwise faultless product, but it was still slightly disappointing to see such boring packaging. But look, forget the box. Forget the slightly small carry case. When those are the only two bad things you can say about a pair of headphones, you know you’ve got a winner. And these are very much winners. What B&W has done with these is nothing short of remarkable: they’ve created a premium pair of headphones, with audio quality that stacks up against much more expensive models…and they’ve done it using Bluetooth. We are officially converted. The P7s are a worthy successor to the company’s P5s, and arguably among the best wireless headphones available today. At the current price - $400 on Amazon at the time of writing – you’d be absolutely insane not to buy these. We will be very, very sorry to send our review model back. For what it’s worth, we don’t think the sound quality of the Zik 3s is quite as good as that of the P7s. But you do get a huge number of extra features, and so they fulfil a niche that the P7s don’t. And it’s not like the sound is bad – far from it. Ultimately, these are a very worthwhile alternative to the P7s, simply because they do things that model does not. Up until we heard the P7s, these were our favourite pick for wireless, Bluetooth headphones. We marvelled at their sound quality in our review, and when we listened to them, we were absolutely certain that they wouldn’t be dethroned for a while. The audio quality, coupled with the extremely good control scheme and faultless performance, made them a natural pick. Now, we think they’ve just been edged by the P7s. That doesn’t stop them being a very worthwhile (and slightly cheaper) alternative. They are almost as luxurious, offer excellent sound, and should be looked at very seriously when you’re trying to decide between the two. The look of these is actually quite similar to the P7s. But where that model goes curved, this one goes straight. It looks like the older brother who moved to the city and became a serious goth. But you still get the metal, the leather, and even more exquisite sound quality (not to mention a more exquisite price). Full disclosure: we haven’t had a chance to give these a full test, although we have heard them before. We can confirm that the audio quality is magnificent, as befits a brand with the reputation of Master & Dynamic, and if you have the extra cassh in your wallet, then they are well worth looking at.